Handedness is a complicated business. To simply say life is left-handed doesn't even begin to capture the blooming hierarchy of binary refinements it continues to evolve. Over the years there have been numerous imaginative theories for how life's amino acids, nucleic acids, and sugars came to favor one orientation over another. Everything from circularly polarized UV light, magnetism of the Earth, oriented clays or quartzes, to the weak nuclear force itself has been considered, but none has yet to securely emerge into realm of plausibility. A recent paper by Dreiling and Gay in Physical Review Letters has now thrown a life jacket to the weak force making it a theoretically viable possibility. To fully vet the author's conception a little work needs to be done. Effort well spent we might say, because to understand where and when the handedness of life's molecules originated is to know the origin of life. The capital "L" forms of aminos acids are the chiral orientations mostly preferred in our proteins. They are said to be left-handed when referenced to the optical activity of an L-glyceraldehyde molecule from which they could in theory be derived. However nine of our nineteen L-amino acids are actually dextrorotatory with a lowercase d (rotate polarized light to the right), when measured at the standard optical wavelength of 589 nm. Similarly the D orientation of glucose, the dextrose of life, rotates light to the right, while D-fructose actually rotates it to the left. The handedness of the DNA helix is more straightforward to assign than values for optical rotation of constituent molecules with multiple chiral centers. The A-DNA helix which life mostly employs, threads to the right when viewed from either direction as sure as a nut threads in either direction on the machinist's screw. 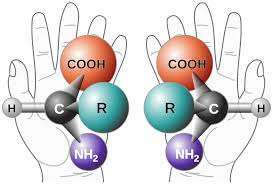 While the debate continues on the exact order in which the many key molecules of life first appeared, amino acids have been the center of attention. One possible explanation for their chirality is that circularly polarized (CP) light preferentially destroyed one amino acid enantiomer over the other, potentially giving it a head start. This idea gained some support when CP radiation in the infrared band was discovered in the Orion Nebula. The main problem with this idea is that CP also destroys much of the "correct" amino acid form as well. Moreover, the magnitude and orientation preference for the effect depends on the frequency of the light. The desireable bias—L selection for the narrow UV light band—would be swamped by competing broadband effects with the result that any long term amplification would grow asymptotically small. Experimentatlly, the CP theory of handedness is not completely dead, only weak. The best result to date has been the creation of 20% optically pure camphor in the lab. Unfortunately this was only obtained after 99% of the original stock was destroyed. If the D form amino acids are life's cancer, than CP light hardly seems to be the most effective chemotherapy. The weak nuclear force, one the other hand, may be a bit more interesting for the origins of chirality. It is one of the four fundamental forces of nature and governs a particular kind of radioactive decay known as β-decay. The weak force has a peculiar handedness, called parity violation, which preferentially produces left-handed electrons during β-decay. For electrons with a left-handed "helicity", the directions its of spin and motion are opposite to each other. In 1967 Vester and Ulbricht suggested that spin-polarized electrons could have directly generated the kind of CP light described above (as so-called bremsstrahlung radiation) to directly enrich the enantiomeric precursors of life. While notable, that mechanism leaves us right back where we were with the CP light shortcomings mentioned above. In this void, other researchers have suggested the polarized electrons themselves, either from radioactive decay or as cosmic rays hailing at the appropriate energy, might be the emissaries of chirality. Against this tableau of uncertaintly there is an interesting theoretical implication of parity violation. That is that both L-amino acids and D-sugars are slightly more stable then their opposites. Unfortunately, the energy differences we are talking about here are only about 10–17 kT. In a racemic mixture of L and D form amino acids, that energy corresponds to an L excess of only one per every 6x10^17 molecules. Finding evidence that direct beta interactions can transmit chirality to organic molecules has been difficult. What distinguishes the results just reported by Dreiling and Gay is that the uncertainty regarding a photonic or electronic mechanism can be reduced by mimicking beta radiation with longitudinally polarized electrons produced in the laboratory at a precisely controllable energy. The researchers used a brominated form of camphor in which an electron could cause release of the bromine in a process known as dissociative electron attachment (DEA). The key to their success was to use incident electrons with low velocity and energy to maximize the "chirality sampling" interactions. In a nutshell, they found that left-handed bromocamphor reacted better with right-handed electrons at modest energies, and better with left-handed electrons at the lowest energies. The effect was small, but enough to take the Vester-Ulbricht Hypothesis to the next level. Beta decay, and the events occuring around it, are perhaps much better described with Feyman diagrams than with words. For many of us, simply explaining why a mirror "appears" to flip left and right but not top and bottom requires more than just imagining circling around it to appear inside it. Determining the far more complex mechanisms that underlie life's handedness will likely remain a significant challenge for some time. "Over the years there have been numerous imaginative theories for how life's amino acids, nucleic acids, and sugars came to favor one orientation over another. Everything from circularly polarized UV light, magnetism of the Earth, oriented clays or quartzes, to the weak nuclear force itself has been considered, but none has yet to securely emerge into realm of plausibility"
Strictly, that isn't factual. Astrobiology text books cover how chirality can be plausibly, and indeed is seen to be, broken by amplification mechanisms. Any random fluctuation can be so amplified. The outstanding issue is what possible pathway was taken. It is also hard to constrain. "to understand where and when the handedness of life's molecules originated is to know the origin of life." Strictly speaking again, that is another outstanding issue. It is difficult to polymerize nucleotides without chiral symmetry, but it can happen. We don't know when it happened, it can well be after life started to emerge. Honored to have your comments Tor., thanks. I would imagine then there are at least a handful or more of other undiscovered, but plausible theories yet to be had. Obviously to know the origin of life would be a broad boast, but what would your prefer over knowing the incidentals of first symmetry breaking? If it's root derives from the subatomic, what could be more fundamental? Together, knowing the plausible and the actual, we have tools to consider how often the "where" might have actually occurred in the universe and what constrains the potential diversity of life therein.